Further Pure 1 Matrices Introduction. 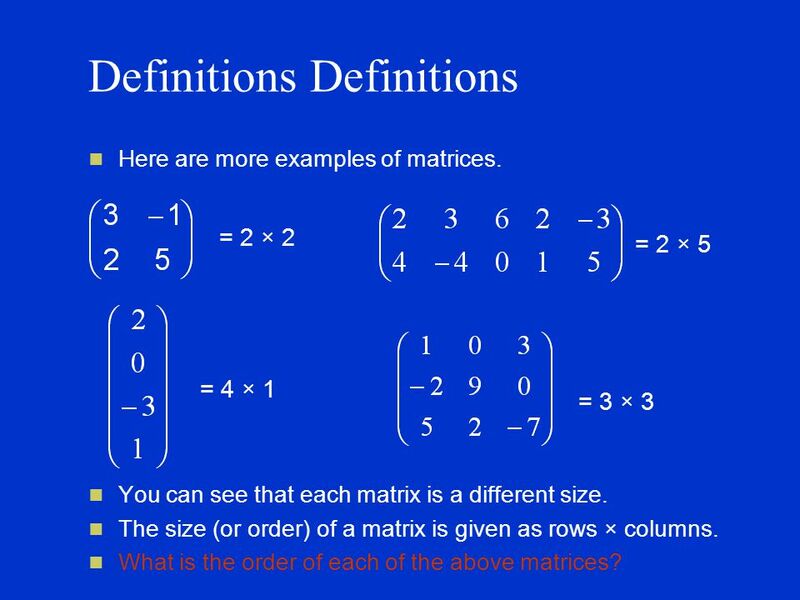 Definitions A matrix is just a rectangle of numbers. It’s a bit like a two-way table. You meet this concept in D1. 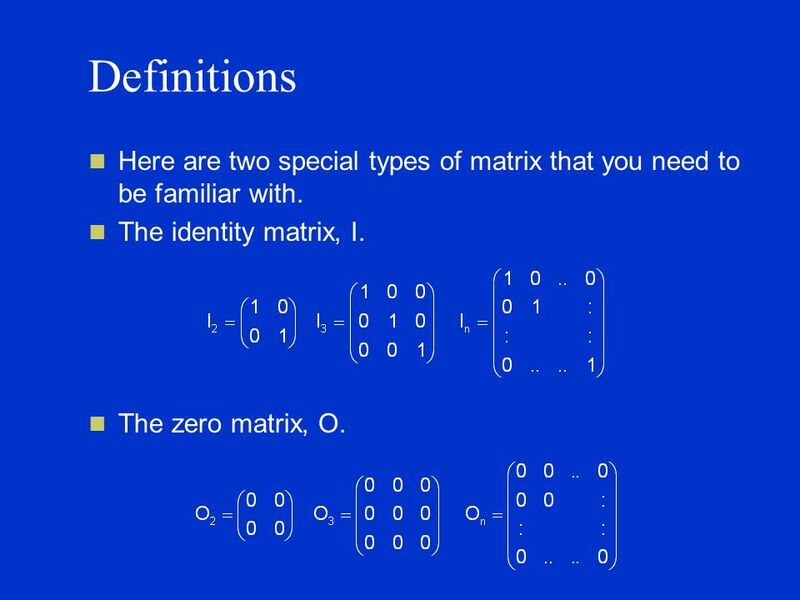 2 Definitions A matrix is just a rectangle of numbers. It’s a bit like a two-way table. You meet this concept in D1. The matrix below shows how many arcs exist between each node. 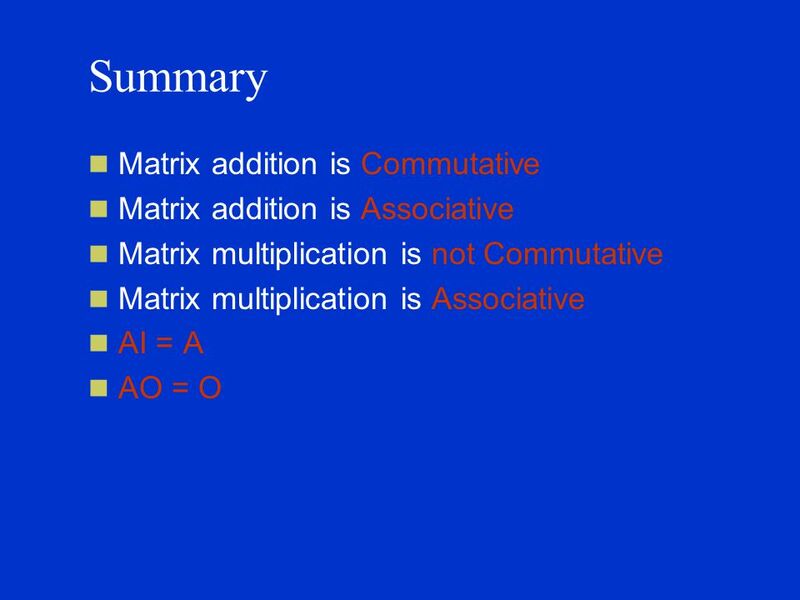 4 Definitions Here are two special types of matrix that you need to be familiar with. The identity matrix, I. The zero matrix, O. 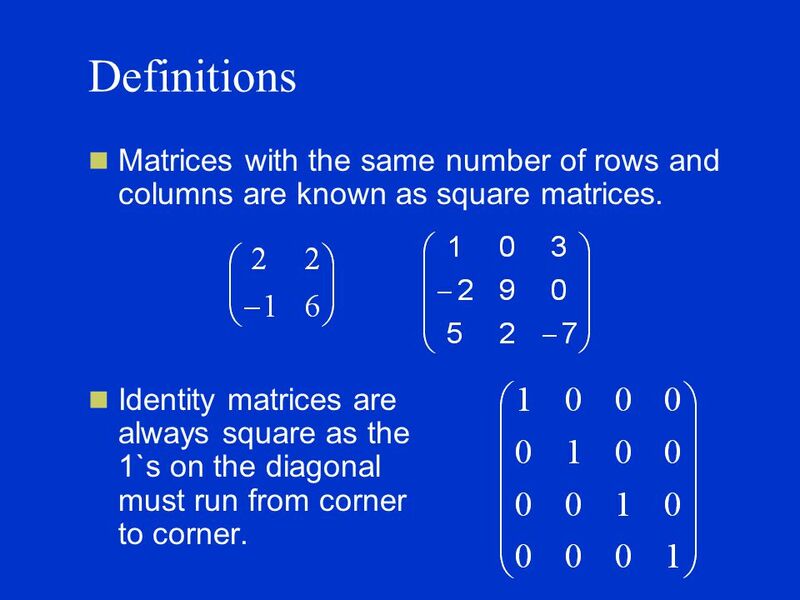 5 Definitions Matrices with the same number of rows and columns are known as square matrices. Identity matrices are always square as the 1`s on the diagonal must run from corner to corner. 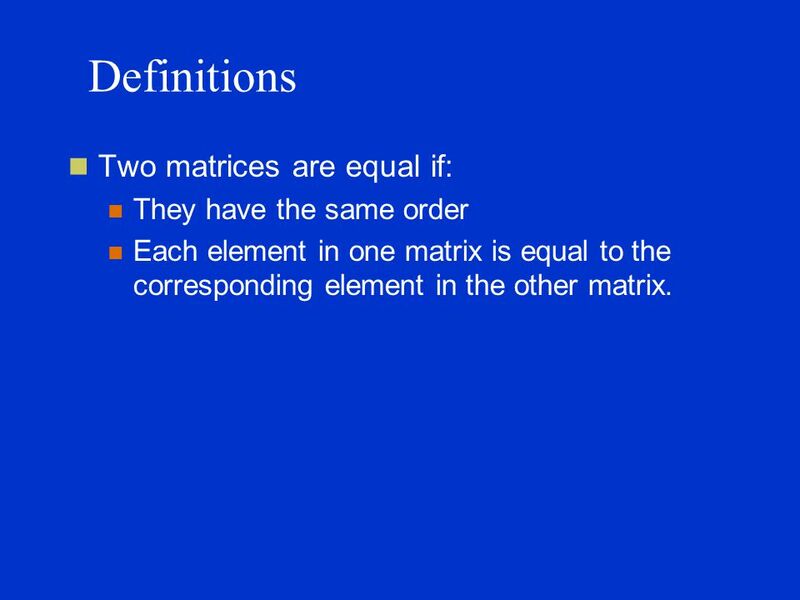 6 Definitions Two matrices are equal if: They have the same order Each element in one matrix is equal to the corresponding element in the other matrix. 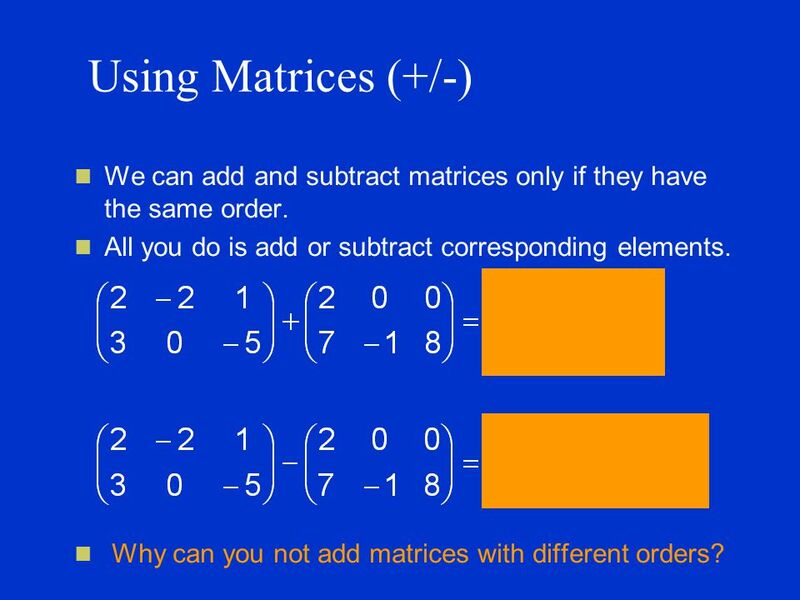 7 Using Matrices (+/-) We can add and subtract matrices only if they have the same order. All you do is add or subtract corresponding elements. Why can you not add matrices with different orders? 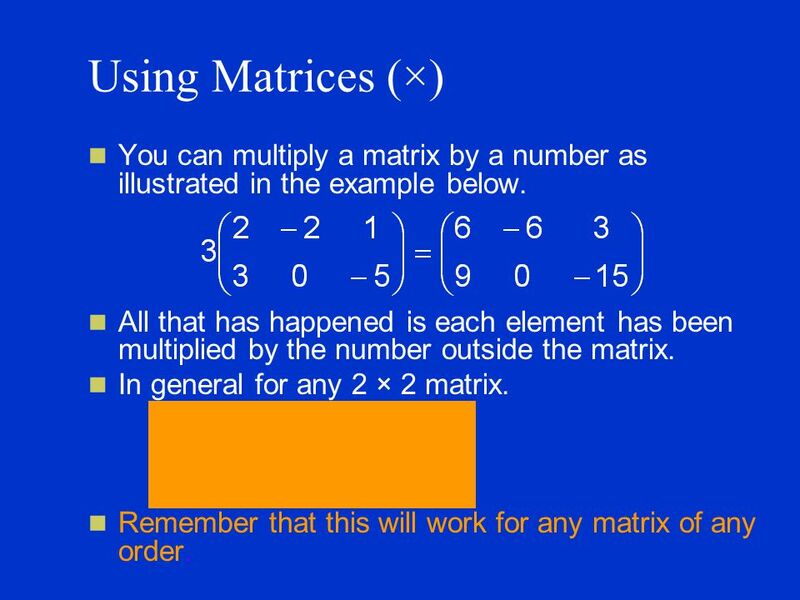 8 Using Matrices (×) You can multiply a matrix by a number as illustrated in the example below. All that has happened is each element has been multiplied by the number outside the matrix. 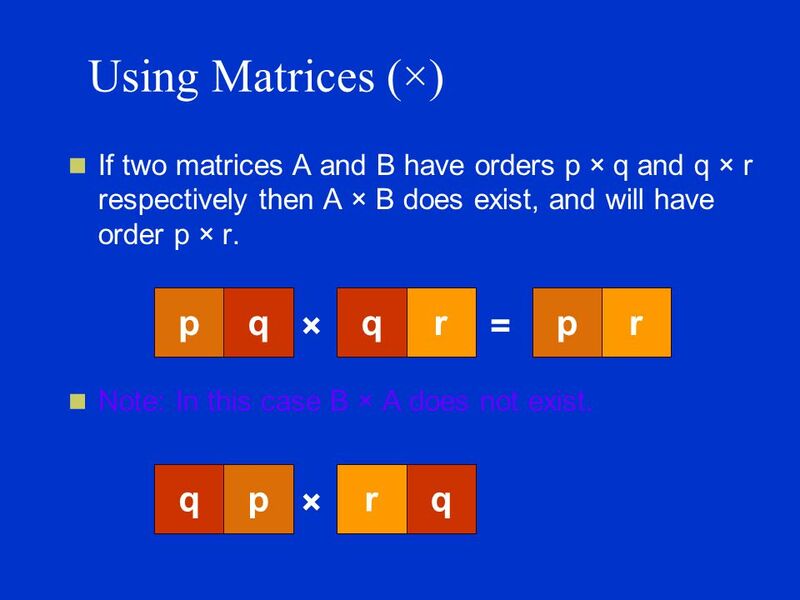 In general for any 2 × 2 matrix. Remember that this will work for any matrix of any order. 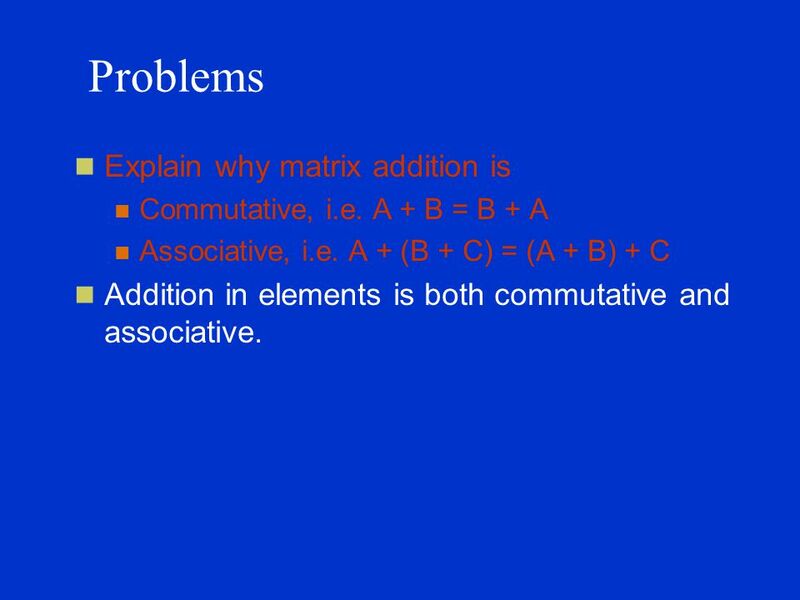 9 Problems Explain why matrix addition is Commutative, i.e. A + B = B + A Associative, i.e. A + (B + C) = (A + B) + C Addition in elements is both commutative and associative. 10 Using Matrices (×) Sometimes you can multiply two matrices together. 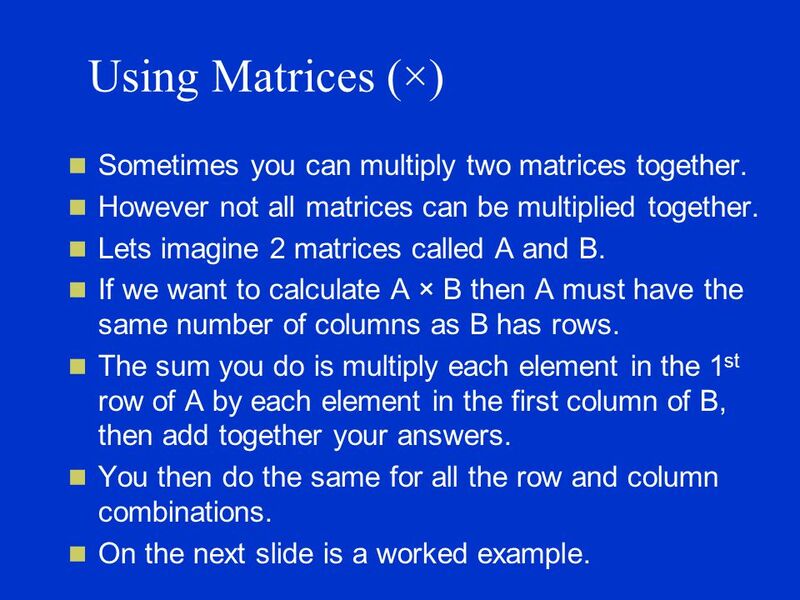 However not all matrices can be multiplied together. Lets imagine 2 matrices called A and B. If we want to calculate A × B then A must have the same number of columns as B has rows. The sum you do is multiply each element in the 1 st row of A by each element in the first column of B, then add together your answers. You then do the same for all the row and column combinations. On the next slide is a worked example. 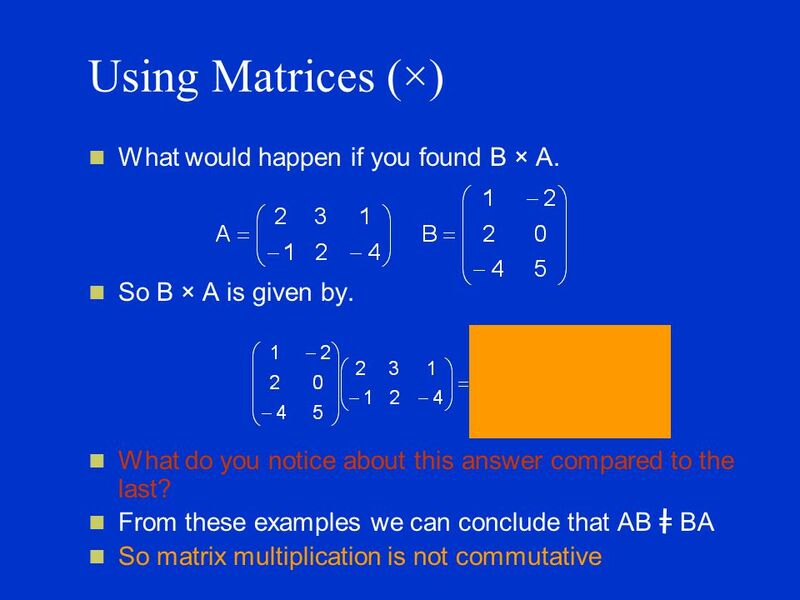 11 Using Matrices (×) Let A be a 2 × 3 matrix and B be a 3 × 2 matrix. So A × B is given by Now take every element in the first row of A and multiply them by every element in the first column of B, adding your answers. Now repeat with the 2 nd row of A and 1 st column of B. Next 1 st row of A and 2 nd column of B. Finally 2 nd row of A and 2 nd column of B. 12 Using Matrices (×) Try the numerical example below. So A × B is given by. Now take every element in the first row of A and multiply them by every element in the first column of B, adding your answers. Now repeat with the 2 nd of A and 1 st column of B. Next 1 st row of A and 2 nd column of B. Finally 2 nd row of A and 2 nd column of B. 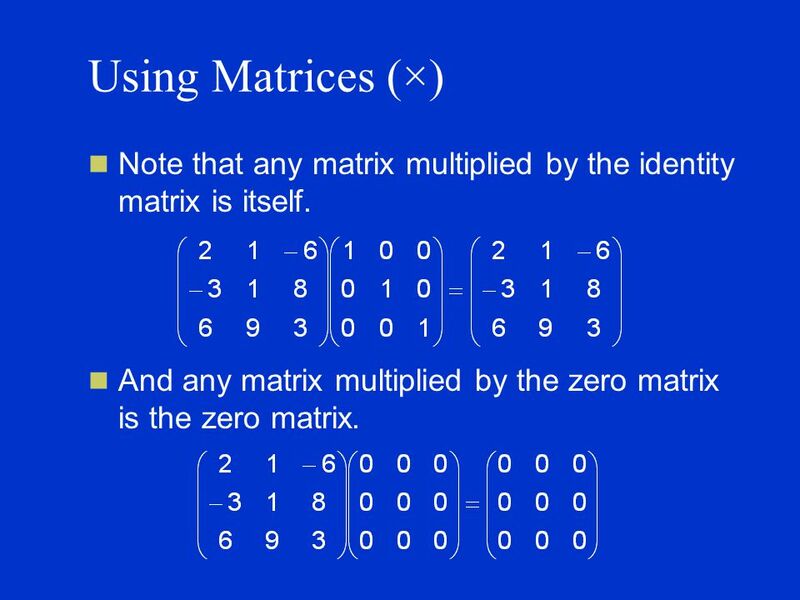 16 Using Matrices (×) Note that any matrix multiplied by the identity matrix is itself. And any matrix multiplied by the zero matrix is the zero matrix. 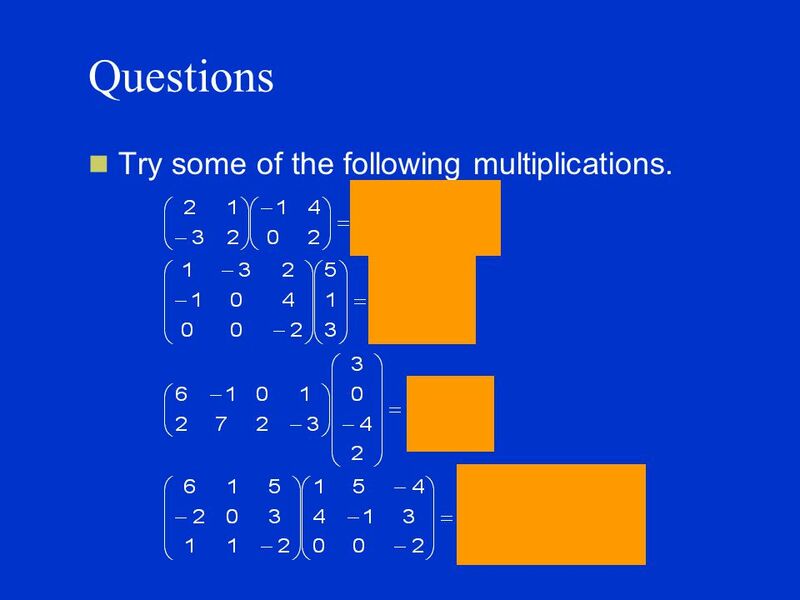 17 Questions Try some of the following multiplications. 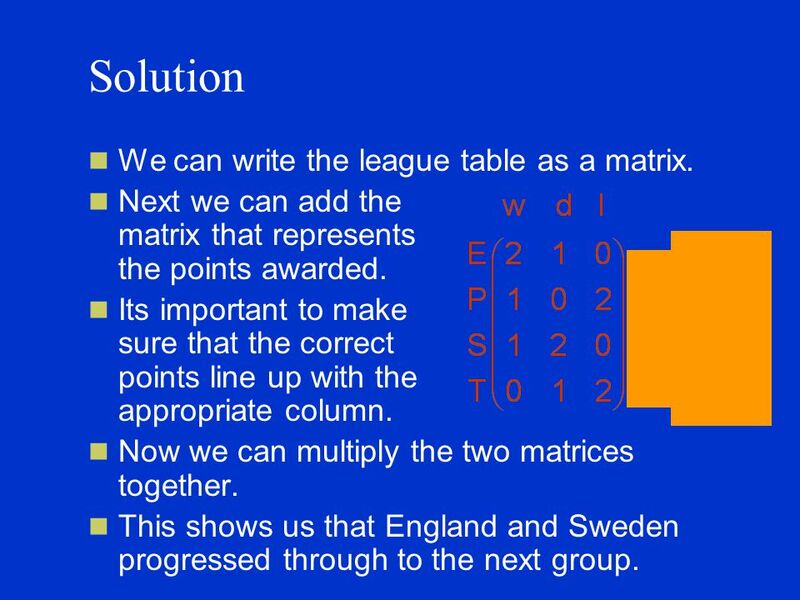 19 Solution We can write the league table as a matrix. Next we can add the matrix that represents the points awarded. Its important to make sure that the correct points line up with the appropriate column. Now we can multiply the two matrices together. 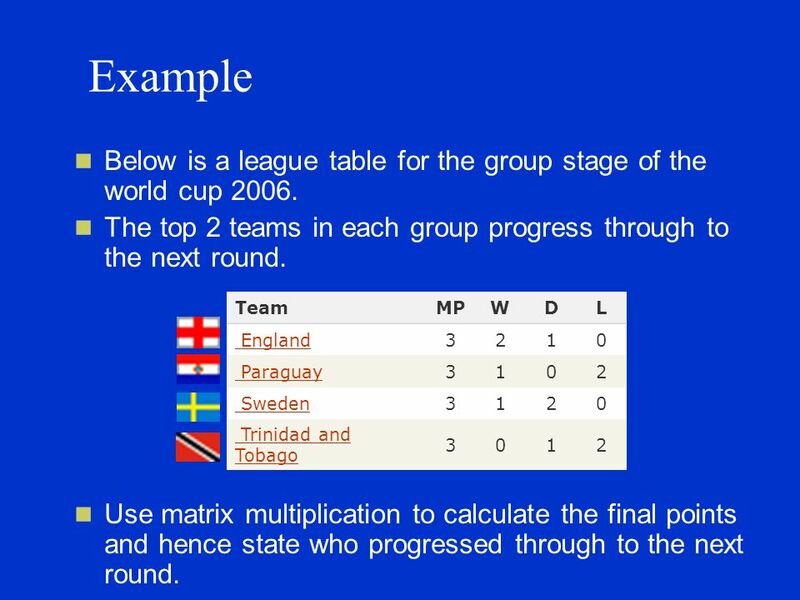 This shows us that England and Sweden progressed through to the next group. 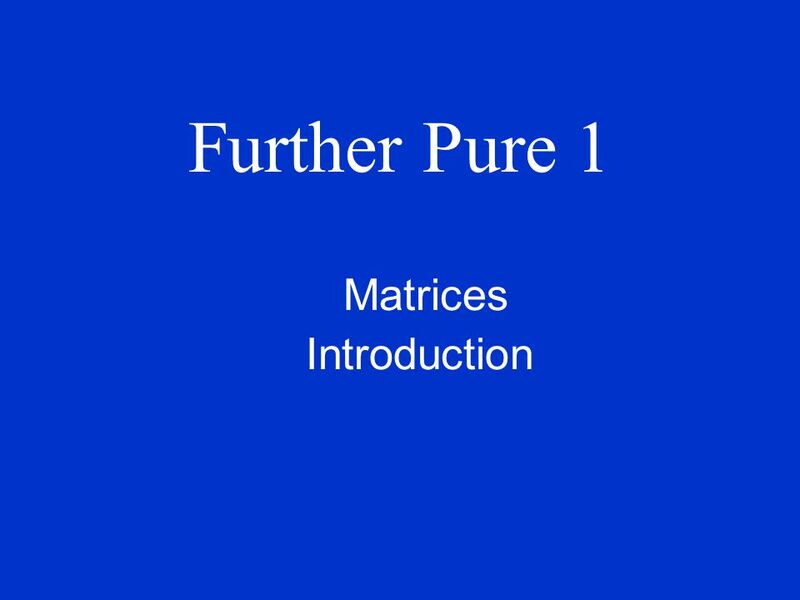 Download ppt "Further Pure 1 Matrices Introduction. 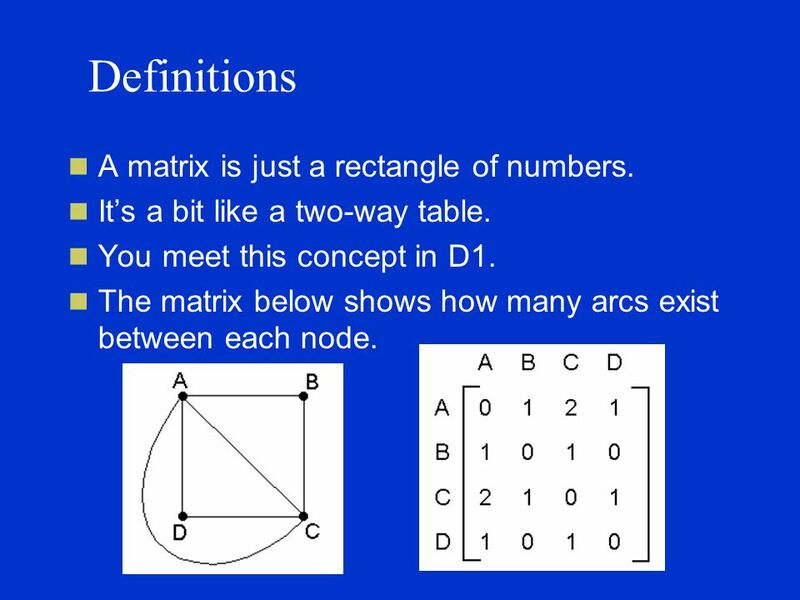 Definitions A matrix is just a rectangle of numbers. It’s a bit like a two-way table. You meet this concept in D1." Gaussian Elimination Matrices Solutions By Dr. Julia Arnold. Mathematics. Matrices and Determinants-1 Session. Chapter 2 Section 3 Arithmetic Operations on Matrices. 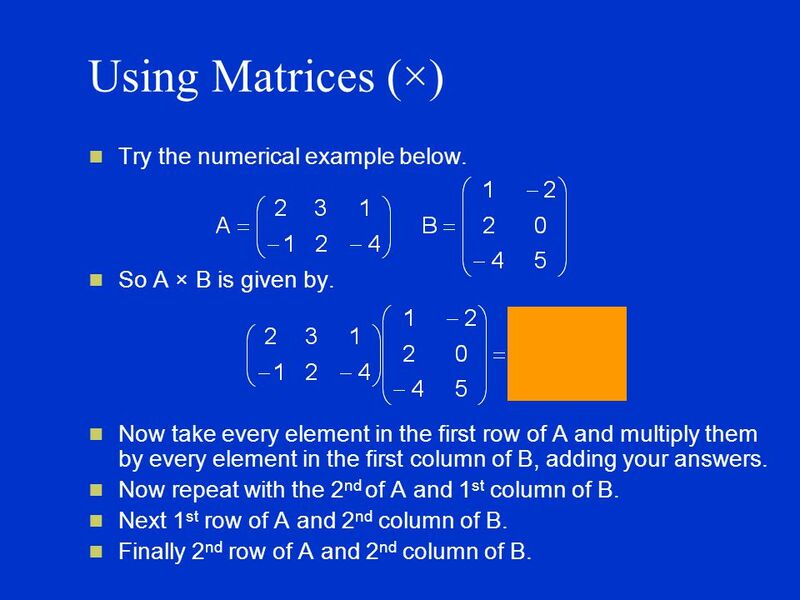 Matrices The Basics Vocabulary and basic concepts. Arithmetic Operations on Matrices. 1. Definition of Matrix 2. Column, Row and Square Matrix 3. Addition and Subtraction of Matrices 4. Multiplying Row. Chapter 11 Section 11.0 Review of Matrices. Matrices A matrix (despite the glamour of the movie) is a collection of numbers arranged in a rectangle or. 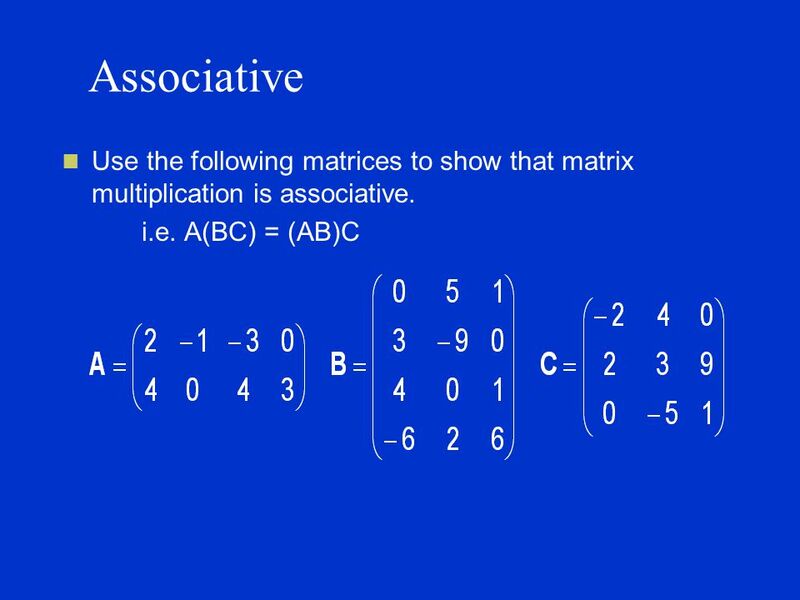 MATRICES MATRIX OPERATIONS. 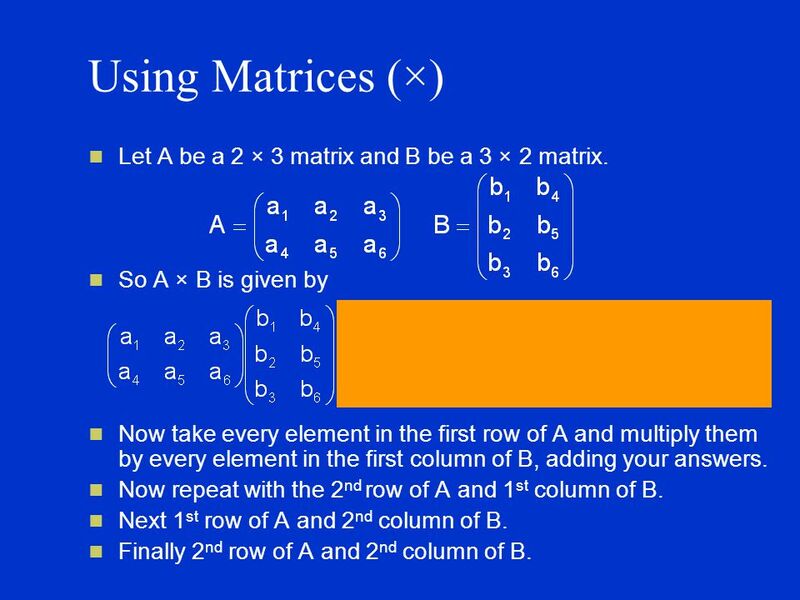 About Matrices  A matrix is a rectangular arrangement of numbers in rows and columns. Rows run horizontally and columns run. 8.4 Matrix Operations Day 1 Thurs May 7 Do Now Solve X – 2y = -6 3x + 4y = 7. Recall that a square matrix is one in which there are the same amount of rows as columns. A square matrix must exist in order to evaluate a determinant. Row 1 Row 2 Row 3 Row m Column 1Column 2Column 3 Column 4. Chapter 1 Number Sense See page 8 for the vocabulary and key concepts of this chapter. MATRICES Adapted from presentation found on the internet. Thank you to the creator of the original presentation! Warm Up. Multiplying Matrices 6.2 part 2 **Multiply rows times columns. **You can only multiply if the number of columns in the 1 st matrix is equal.